All companies dream of finding the perfect customer base – but it’s rarely as simple as it sounds. To analyse and recruit customers whose needs are closely aligned with a business’s core products and services can be a complex task requiring focused market analysis and research. 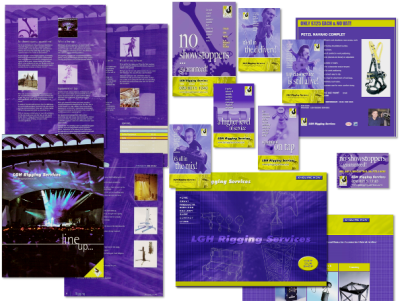 Established in 1997 as an equipment resource for the UK entertainment industry – including film, TV, theatre and event production – LGH Rigging Services* quickly became one of the country’s premier specialists, offering a comprehensive range of stringently tested high quality hire equipment. As business grew, the management team realised that in order to maximise their returns in a marketplace with a wide range of prospective customer types, they needed to understand those customers most likely to require their services. Prior to developing a targeted campaign, Communisage founder, Mike Cowburn, researched and prepared a detailed analysis of the market structure, segmentation and customer needs. Prospective routes to market for rigging equipment were investigated in order to strategically align the company’s proposition with clients whose needs they most closely matched and among whom Rigging Services could develop a competitive edge to grow its business. As a result of this activity, Rigging Services was repositioned as a hire company that provides a virtual extension of customers’ warehousing with specific targeting in one of three prospective segments: rock ’n’ roll, exhibition and event organisers; film and TV production; and theatres and public auditoria. The quirky creative approach employed achieved excellent stand-out in leading trade magazines which are filled with high-intensity entertainment industry imagery. The campaign not only raised the company’s awareness and visibility among production companies and firmly positioned Rigging Services as the first choice for sub-contractors, it also generated valuable sales leads and ultimately helped to consolidate and expand geographical coverage in the South and Midlands. * Intellectual property rights to the LGH brand in the UK are owned by Speedy Hire plc following their acquisition of this business. Rigging Services now trade independently in this name. The company has since enjoyed increased success and a further Rigging Services location in Manchester has also been opened.